Quality North American style handmade laminated wooden landing nets for stream and river or estuary and boat in multi-tone hardwood construction. Beautifully crafted lightweight landing nets. Multi laminated mahogany, beech and ash hardwoods. Hand-shaped in a durable clear UV resistant finish. Set up with french clip. Stretch cord for attachment to belt loops or ‘D’ rings. Knotless 3mm soft micro-mesh netting, gentle on fish. A compact multiple use net set up with tough 2mm micro netting over strong lightweight anodised aluminium frame. Twist the ergonomic EVA handle a 1/4 turn to extend and twist it back to lock, it's that quick. No more fish just out of Reach whether you're midwater, high on the bank, in your canoe or kayak or on the wrong side of that big log ! The carbon swivel-clip on the non-slip EVA handle can be attached to a vest or a net release clip. You'll find this compact tear drop shaped Reach net a real asset in so many fishing situations. Net - 76cm long extends to 100cm max. The Magnetic Release Clip is a well designed multifunctional accessory. While often used primarily as a magnetic net release, this very useful attachment system can be put to good use in many applications. Used as a net release, just get the powerful snug-fitting magnetics close together and they 'snap' instantly into place every time. The system can even be separated for different applications. The coiled spring-cord can be attached to the angler with the thumb clamp and used to keep a net, wading staff or any other accessories in contact. 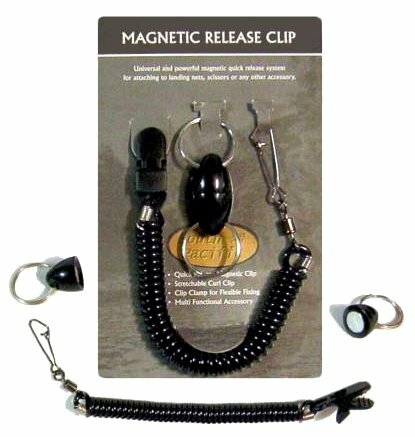 There's many uses for this Magnetic Release Clip it's only limited by your imagination. Imagine the multiple uses !